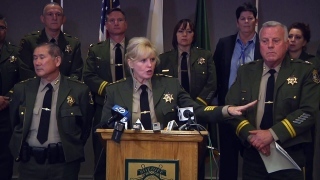 Santa Clara County Sheriff Laurie Smith issued statements Tuesday evening after receiving criticism for a jail reform report she requested be commissioned that ended up not being heard by the county's Board of Supervisors. Smith called the motion carried not to move the item to the meeting's consent calendar "unfortunate" and cited its author, former Ada County Sheriff Gary Raney in Idaho, as a national expert. "Critics were quick to point out flaws in his report, yet Mr. Raney was not given the opportunity to describe the scope and process of his review in an open forum," Smith said in a statement. That statement was released at 5:50 p.m., and another followed it at approximately 7 p.m., which addressed comments sheriff's candidate and former Undersheriff John Hirokawa made outside meeting chambers regarding recent allegations that Smith sexually assaulted a colleague early on in her career. "I am highly offended by opportunists hiding under the guise of the #MeToo movement to make political points to aid my critics," Smith's second set of comments stated. "The most recent false allegations show that women, at any level, are not immune from sexist attacks even today." Smith said that the allegations that she pulled interview tapes from an internal affairs investigation, hiding accusations that she had sexually harassed a male co-worker, were "determined to be false over 25 years ago by County Counsel through an independent and thorough investigation." Smith said that she refuses to let the allegations distract her from her duties as sheriff. Hirokawa and former Santa Clara County Superior Court Judge LaDoris Cordell spoke out against the report done by GAR Inc. and called for Smith's resignation prior to the Board of Supervisors meeting Tuesday morning. Cordell called the 66-page document "a convoluted puff piece" because it points out existing issues within the jail system in the county yet praises Smith and her staff for their work. The report followed several reform efforts that resulted from the 2015 death of Santa Clara County jail inmate Michael Tyree at the hands of former guards Jereh Lubrin, Rafael Rodriguez and Matthew Farris. In the wake of the death, the Board of Supervisors approved a resolution establishing a Blue Ribbon Commission on Improving Custody Operations, which was chaired by Cordell. The commission worked to receive public recommendations, discuss an inmate welfare fund and interview the inmates themselves to gauge what could be done. Hirokawa stated that he believed the survey conclusions that came from the commission two years after Tyree's death "somewhat critical." The commission's survey called for a higher level of community involvement in regulation the jails moving forward, but the GAR report stated that wasn't necessarily appropriate. Hirokawa was confused as to why the sheriff's office contracted the report instead of the county-associated commission. "Why wouldn't you go back to the original, go back to the baseline that reported on how the inmates were feeling?" Hirokawa asked. "This is a propaganda piece for the re-election of Laurie Smith."